1. The Black Hawk Purchase: This is represented by the area numbered 175 in the map above. This wasn't really a purchase, but we like to delude ourselves in our history books. At the end of the Black Hawk War of 1832, General Winfield Scott used the occasion and the presence of large numbers of troups and militias to force the Sauks who followed Keokuk (and who were not a part of the conflict), the Meskwaki (who also did not participate), and the Ho-Chunk (Winnebago) to sign a treaty ceeding the area, which was roughly from the Mississippi River westward for 50 miles. Although the tribes did receive monitary compensation for their land, they did not do so voluntarily. The federal government got the stratigic land along the major highway of the day (the Mississippi River), the lead mines that had belonged to the Meskwaki, and land to be sold to settlers. The Meskwaki moved to areas along the Cedar and Iowa Rivers. Poweshiek's village was near where Iowa City is today. The Sauk relocated along other rivers, including the Des Moines. Any time tribes were relocated, there were increased conflicts between the refugees and the tribes who were already there. The conflicts between the Meskwaki and the Sioux who inhabited the northern part of what became Iowa intensified, and the Sauk displaced some of the Ioways who had occupied lands along the Des Moines, forcing them westward. 2. Keokuk's Reserve: A treaty with the Sauk and Foxes of 1836 ceded the land with the number 226 to the federal government. This land was set aside as a part of the treaty of 1832, and the land was quickly encroached upon by the white settlers. Some of the land had been sold to early settlers prior to the treaty (transactions the federal government didn't recognize). This treaty did not significantly change anything for the Meskwaki. 3. The Treaty of 1837: A number of the chiefs went to Washington City for a peace treaty in 1837. Poweshiek's concern was increasing tensions with Sioux over hunting territories, although Keokuk had probably already been negotiating for the sale. The visit to Washington was a big event for all involved, and they were treated like rock stars. The treaty that resulted did have some land cessions. Poweshiek and the Meskwaki relocated to areas along the Iowa River, near present day Tama and Marshalltown, and areas along the Des Moines River, especially where the City of Des Moines is now located. Poweshiek accompanied General Joseph Montfort Street on an expedition to find a location for the Indian Agency, which became Agency City (now just called Agency), east of what is now Ottumwa. The period of 1837 to 1844 was a period of terrible decline for both tribes. There was a failed attempt, in 1841, to get the tribes to agree to sign a cessation treaty which would have sold the lands for a million dollars and relocated the tribes to Minnesota. The treaty had been negotiated by Keokuk, and had been an agreement between Indian Agent John Beech, Joseph Street having died in 1840. Keokuk was surprised as was John Beech when they were flatly turned down by the rest of the chiefs, including Wapello and Poweshiek. The winter of 1841-1842 was especially bad for the Meskwaki, and a number of them died. Wapello died in the spring of 1842. 4. The Treaty of 1842: This treaty sold all Sauk and Fox claims in Iowa to the Federal Government,and required them to move west of the "White Breast Line" by 1843 and to remove to Kansas by 1845. 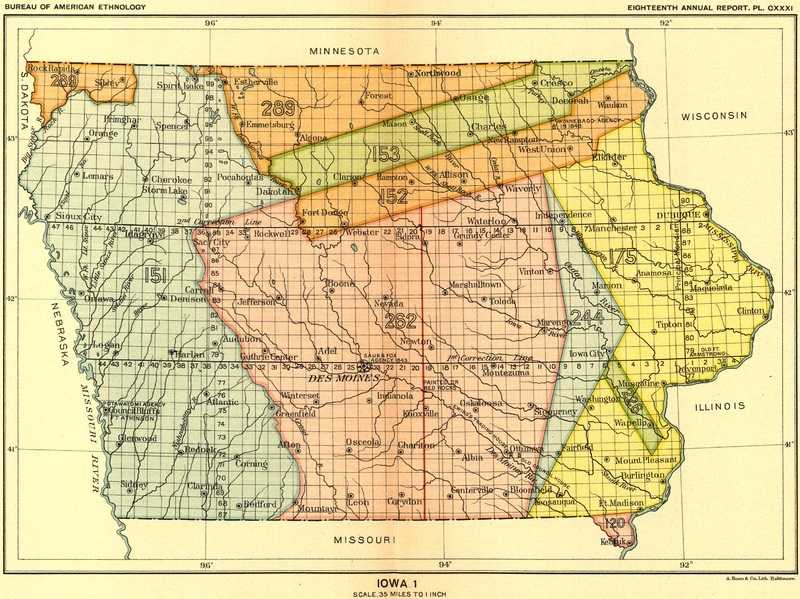 This treaty opened up Iowa for settlement, and led directly to it becoming a state. Poweshiek did sign this treaty, although reluctantly. He attempted to sell a portion of the land first, and to remain in Iowa, although that offer was not accepted. A square mile of land was set aside to General Street's widow, and money for a grave stone for Wappello, who was to be buried next to his friend. Following the treaty, Poweshiek and the Meskwaki resisted removal. They did not fight with the troups that were removing them, but they allowed themselves to be removed in such a "disorganized" fashion that a major portion of the tribe disappeared (and reappeared back in Iowa) during the process. Poweshiek led the Meskwaki back into Iowa on at least two occasions. Both times they were removed again by the military. Poweshiek was always careful to maintain good relations with the settlers. Poweshiek resigned--he turned the position of the chief over to Ma-Me-Nwa-Ne-Ke. Poweshiek died in 1854 in a fall from a pony. In 1856, Iowa passed a law allowing the Meskwaki to remain in Iowa, so long as they were peaceful. In 1857 a small band of Meskwaki returned to Iowa to make their first land purchase and to live on that land.